Airbus used its own flight-test A340-600 for the CRISTAL ITP cruise-altitude change test in oceanic airspace near Iceland, in late March. The demonstration, which was successful, also involved an Scandinavian Airlines A330 operating a passenger flight, the A330 serving as a reference aircraft. A recentflight demonstration of a new procedure permitting altitude changes at cruiselevels in oceanic airspace should soon allow airliners to burnless fuel and reducecarbon dioxide emissions on transatlantic flights. TheAirbus-led CRISTAL ITP test, which involved two Airbus widebody jets ? oneoperating a scheduled passenger flight ? cruising west over the ocean south ofIceland, was very successful, said Airbus executives Stephane Marche and ThomasFixy. Marche is project leader for CRISTAL ITP, while Fixy is Airbus'Multi-Program Manager and oversees a variety of programs that include CRISTALITP. "Fromoperational perspectives, there was good acceptance (of the results of thetest) by controllers and pilots," said Fixy and Marche. "We believewe can achieve a timely implementation of this procedure ... We are quiteoptimistic it will be implemented around 2010 operationally over the North Atlantic." At present,airliners cruising over the world's oceans are generally unable to changealtitude to improve their flying efficiency or take advantage of favorablewinds. This is because oceanic airspace beyond a certain distance from landcannot be controlled by radar, which has limited range. Consequently,controllers and pilots rely on "in trail" procedures to maintain safedistances between aircraft cruising at the same altitudes. These distances aremaintained by ensuring that each aircraft at a particular flight level on agiven track is flying in the same direction, that each is cruising at the samespeed, and that all aircraft are at least 10 minutes' cruising time apart fromeach other. The 10-minute time interval equates to about 80 nautical miles atcommercial-jet cruise speeds. Changes incruise altitude which cannot be monitored by radar aren't generally allowedbecause they could compromise the minimum specified in-trail separation betweenaircraft. However, inlate March the partners in CRISTAL ITP (the 'ITP' standing for 'In-TrailProcedure') used satellite-navigation-based AutomaticDependent Surveillance?Broadcast (ADS-B) technology to demonstrate safecruise-altitude changes in oceanic airspace. ADS-B is now being developedinternationally to replace radar as the world's primary method of air trafficcontrol (ATC) worldwide by the early 2020s. Theairspace in which the demonstration took place was close enough to Iceland thatthe two aircraft involved were radar-monitored by controllers at Iceland's ATCprovider Isavia at all times during the test, and so safe separation betweenthem could be ensured, said Marche and Fixy. Isavia and the UK ATC providerNATS are partners in CRISTAL ITP, as are Airbus, SAS, and Eurocontrol CASCADE,the program coordinating the planned implementation of ADS-B throughout the EUby 2015. One of thetwo jets, a ScandinavianAirlines Airbus A330 cruising at flight level 310 (a standard pressurealtitude of 31,000 feet) on a passenger flight to North America, acted as areference aircraft for the demonstration. The A330 was fitted with the 'ADS-BOut,' GPS-derived, position-broadcasting technology already certified for allmodern Airbus jets. This jet didn't change altitude and constantly broadcastits position and altitude to the controllers in Iceland and in the UK who were monitoring the demonstration. The otherjet, Airbus' own A340-600 test aircraft, was fitted with new 'ADS-B In'technology that allows pilots of aircraft to see the positions and altitudes ofall other aircraft in the area. ADS-B In receives direct positional informationfrom aircraft using ADS-B Out and also can allow an aircraft to receive TrafficInformation Services?Broadcast (TIS-B) data on aircraft positions and altitudesbroadcast by ATC providers. As aresult, the pilots of the Airbus test A340 could assess the distance between itand the SAS aircraft at all times during the test and request controllerclearance for altitude changes when the aircraft were at safe distances. Thedemonstration involved four separate steps. In the first, the A340 climbed fromflight level 290 to flight level 320 from a position ahead of the SAS A330. Instep two, the A340, still ahead of the A330, descended again to 29,000 feet. Then theA340 performed an orbit maneuver at that altitude to let the SAS A330 pass by2,000 feet above the Airbus test jet. From the A340's new position behind andbelow the A330, step three involved it ascending to flight level 330. Step fourwas a descent from flight level 330 back to flight level 290, still behind theSAS aircraft. Airbus isnow analyzing the CRISTAL ITP ADS-B data from its flight-test A340, comparingit with the data obtained during the test from the Isavia radar at Reykjavikand with simulations run at the NATS Shanwick oceanic ATC simulator in linkagewith Airbus' own ATC simulator. However, itis clear that during the demonstration the two aircraft never came closer toeach other at the same altitude than 25 miles, said Fixy and Marche. Also, thedata suggest that when operational the CRISTAL ITP procedure will be preciseenough that controllers will be able to reduce horizontal-separation distancesbetween cruising jets to 10 nautical miles as they change altitudes, allowing agreat deal of operational flexibility. 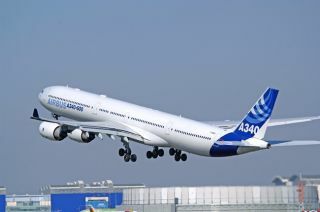 Airbusfuel-burn data suggest CRISTAL ITP would produce a 170-kilogram average fuelsaving on a transatlantic flight for an aircraft the size of an A340-600. Foraircraft now constrained by ATC requirements to fly 2,000 feet below theiroptimal cruise altitudes, the saving could reach 760 kilograms, said Marche and Fixy. And the larger the aircraft, the larger the saving ? A380s or 747s wouldsave more fuel than A340s. On averagesome 400 commercial jets fly westbound over the North Atlantic every day andsome 300 fly eastbound, according to Airbus; at these traffic rates, CRISTALITP could produce a total fuel saving of some 120,000 kilograms a day. Even thoughthe FAA isn?t mandating ADS-B for all U.S. airspace until 2020, transatlanticflights will start seeing flight-efficiency benefits from its use much soonerthan that. ADS-B is being introduced in remote, less densely traffickedairspace first. It is already in use for half of Australia's airspace, and isbeing introduced over Hudson Bay in November.